Who doesn’t like a moist cupcake?? This good old standby recipe can be used to make cupcakes or will work as a super sheet cake when you don’t feel like messing with filling cupcake cups. Freezes easily and just as a note-left over cream cheese frosting freezes beautifully as well. 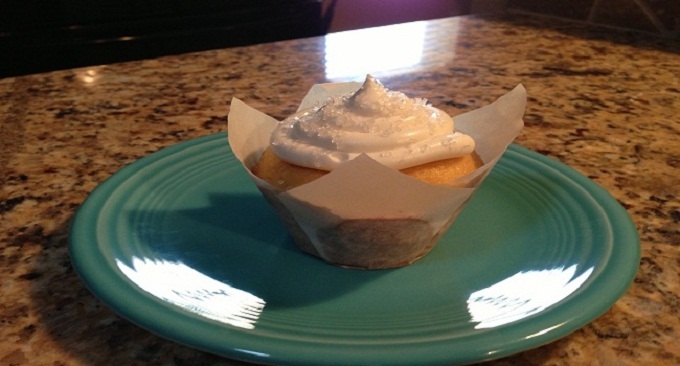 Whatever frosting you have left over, place in a plastic freezer bag pushing the frosting into a corner. When ready to use take out of the freezer and leave out on counter about five minutes then knead frosting a bit, cut off corner of plastic bag then pipe the frosting out onto whatever delicious you have made. Line 24 cupcake tins with liners or spray with a non-stick cooking spray. Remove from heat and whish in flour, baking soda, salt, sugar, eggs, sour cream, and extracts. Scoop batter into prepared cupcake tins and bake 12 to 14 minutes or until a toothpick stuck in the middle of a cupcake comes out clean. Cool on a wire rack and frost once cooled. In an electric mixer combine cream cheese, butter, powdered sugar, and vanilla and beat at least 4 to 5 minutes, scraping the bowl down once or twice, until frosting is light and fluffy. « Welcome Wednesdays :: Red, White & Blue – Is it for you?